This isn’t a post about writing books. Or even a post about responsibility or creativity or the writing life or being gainfully employed. I mean, it’s kind of about those things? But also, it is so much bigger. Sometimes I use this blog as a place to talk about my favorite things, and today I’m going to tell you my favorite thing about being an adult. Once, I was on TV! Here is a half-hour interview I did with the Bookends Program, for my hometown school district. It is conducted by two really wonderful local students, and the dear and indispensable children’s librarian of my youth, Sue-Ellen Jones. In it, I answer a lot of questions about The Replacement and The Space Between, and talk about high school, folklore, and Shirley Jackson. 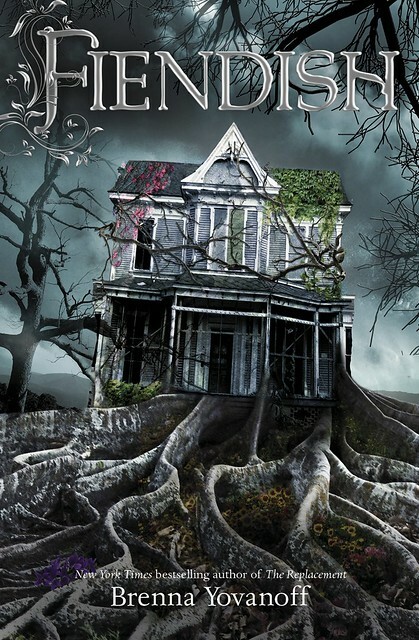 Fiendish is a book about being wild. And loving where you live. And sticking to your principles. And loving the people who love you back. And figuring out what makes you magic. And whenever I describe things, I always seem to think that subject and theme are the same as plot, which is NOT true. So now, here is what the story-copy says! Remember that time I wrote a book and disappeared from the internet for basically months and months, except when I would occasionally monopolize Tumblr to make everyone look at animated gifs from old horror movies and relive conversations that I had with D about counting jellyfish? It’s official! We get to do another book together, and it will be big and pretty and full of more stories about kissing and more pertinent annotations using the magic pens! Oh, high school, you crazy, crazy diamond. So, it’s been a really long time since I’ve done one of these posts. And I can make tons of excuses—book stuff, holiday stuff, constant travel—and they are even legitimate excuses (insofar as excuses are ever legitimate), because all those things actually happened. If I’m being honest though, those are not the reason I haven’t trotted out teenage-Brenna in awhile. The truth is that I’m just moving very slowly now. The reason for this is that by November of senior year, the eighteen year old version of me has become a creature who thinks waaaaay too much. I never remember to talk about my books. This is weird, because I think about them a lot, and not just while I’m writing them. I think about structure and nuance and what things mean, and how I think something should look in order to communicate efficiently or illustrate a point I want to make. This is because, as much time as I’ve spent inventing made-up people, as much as I love to submerge myself in imaginary worlds, the thing I have always cared more about than anything else in the entire storytelling world is THEME. BUT, I’m happy to report that this last month has been really excellent and full of All Good Things. Paper Valentine has been out for two months. Seriously you guys, I can’t even explain how grateful I am for all the reader-love it’s been getting, and how fantastic it was to talk to so many of you during the Breathless Reads tour. In my head, there is a particular sort of high pitched tea-kettling sound that I can’t accurately reproduce in writing because it’s incredibly shrill and also only inside my head. So for the purposes of this post, you will just have to imagine it, and it is the sound of me having finally turned in my draft. Now … I plan to do many things. For instance, wash some socks, make a pot roast, eat little red candies shaped like raspberries, and watch a million billion episodes of the Lizzie Bennet Diaries, but before I do that, here is this very awesome, important thing! Which means that Paper Valentine is now available in stores—stores like my unassailably-awesome indie, Tattered Cover, where they are super-nice and friendly and invite me to sign copies and even let me take pictures! 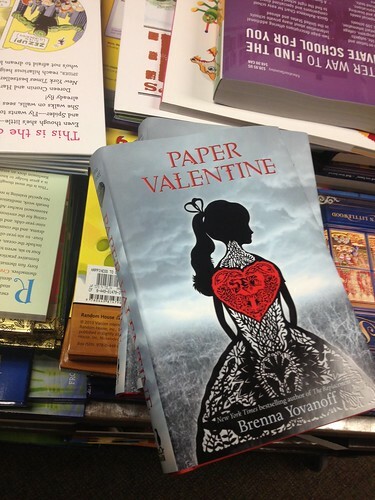 Here is Paper Valentine in the wild. I took this picture myself, which is why it is characterized by very weird composition. But that’s okay, because I think Paper Valentine looks nice nestled in with all its book-friends. *Also, no, seriously—what day is it, because D has been on a business trip all week, which means that now I don’t have a bedtime and sometimes it’s very hard to tell if it’s a new day, or still the same day and I was just napping.